Last month, Warner Bros. released the epic blockbuster Kong: Skull Island, which not only explored the home island of the iconic King Kong, but also set up an expanded universe that connects to the studio's 2014 hit Godzilla. While Michael Dougherty has come aboard to direct Godzilla: King of Monsters (March 22, 2019), the follow-up Godzilla vs. Kong (May 29, 2020) doesn't have a director, but it seems that Kong: Skull Island director Jordan Vogt-Roberts is not interested in making another monster movie. When Kong: Skull Island opened last month, it was a hit with critics, with a 77% Fresh rating on Rotten Tomatoes, and with fans alike, earning $163.9 million domestically and $559 million worldwide from an $185 million budget. During a chat with Screen Junkies News, director Jordan Vogt-Roberts was asked if he would like to take the helm for the follow-up Godzilla vs. Kong, but the filmmaker stated that he was done with monster movies. Here's what the director had to say, while praising the studio for letting him make the movie he wanted to make in what has become known as the MonsterVerse. "I think I'm done with giant monsters for a little bit. Look, I'm really proud of this world, and I'm super proud of, I think in general, and this is out there too, the response being 'Why do we need a new Kong movie?' and that was my response. I'm really proud of how weird this movie is and how much people embraced that stuff and actually called out how strange the movie is, and I wanted it to have a voice. I'm so proud of what we did and how I think it is very non-traditional blockbuster in 2017 and I'm so proud of what Legendary and Warner Bros. and those guys allowed me to do and the collaboration we had, but I definitely don't think I got Kong vs Godzilla in me. You never say never, I'm so proud of the Kong we made and the vibe of him and the energy of him and the vibe of the creatures on the island and everything, but yeah it would be tough for me right now." Jordan Vogt-Roberts signed on to direct in 2014, fresh off his feature directorial debut, the 2013 indie hit Kings of Summer, following a path that many indie filmmakers before him had, such as Colin Trevorrow, who went from the low-budget Safety Not Guaranteed to Jurassic World and Gareth Edwards, who parlayed his indie hit Monsters into directing the 2014 blockbuster Godzilla. Warner Bros. and Legendary have already set up a Godzilla and King Kong writers room, and when asked if he's stepping away because it's challenging to make a film in such a big universe, the filmmaker had this to say. "I was very loud, and probably very annoying, about saying, halfway through these (shared universe) movies, there's a 15-minute departure, trying to set up a movie that comes out in four years. It's just such a bummer to me. I was very loud about saying, this is not just about this franchise and this universe, we're playing with King Kong. King Kong is film history. There are a bunch of people who will show up to this movie that have no interest in Godzilla vs. Kong, have never seen Godzilla, and Kong is film history. Yeah, there is a ton of stuff in the movie that sets up the worlds and merges them, but I am proud and very thankful to the studios that they let us try to make something as self-contained as possible." 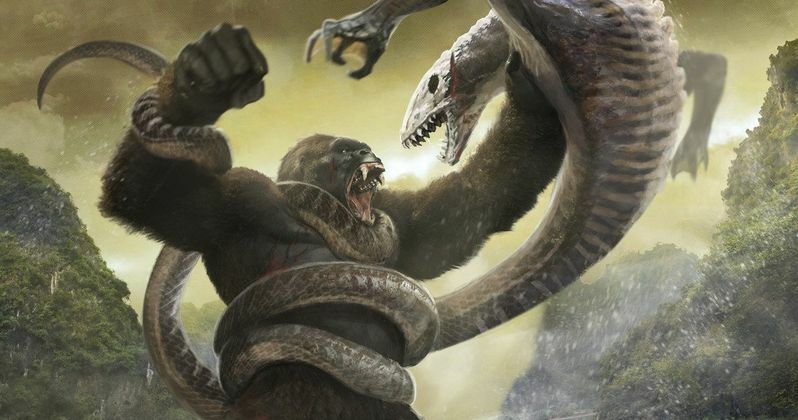 Aside from Godzilla: King of Monsters and Godzilla vs. Kong, no future movies have been confirmed yet, but with a writers room already set up, there will most likely be more movies on the horizon after Godzilla vs. Kong hits theaters in 2020. Michael Dougherty and Zach Shields (Krampus) are both writing Godzilla: King of Monsters, with Michael Dougherty directing and both writers leading the writers room. While we wait for more on Godzilla: King of Monsters and Godzilla vs. Kong, take a look at Kong: Skull Island director Jordan Vogt-Roberts' interview below, with the Godzilla vs. Kong talk coming at the 18:06 mark.